47…and the Lord set toward [i.e. added to] the ones being saved according to (the) day [i.e. daily] e)pi\ to/ au)to/. Here I would focus on the expression kla/si$ tou= a&rtou (klásis tou ártou), “breaking of bread” in verse 42, which is mentioned again in verse 46 in slightly different form: “breaking bread according to house”. The modifying expression “according to house” (kat’ oi@kon) means that the “breaking of bread” took place in one house, then another—presumably an indication that the larger group/community met in the houses of different believers in turn. But what of this “breaking of bread”?—does it represent: (a) ordinary meals, or (b) a celebration of the Lord’s Supper (Eucharist)? On the surface, it would seem that ‘ordinary’ communal meals are meant, as in v. 46 where it says that the believers “took food/nourishment with (one another) [metala/mbanon trofh=$]”. However, most scholars today would, I think, hold that some form of the Lord’s Supper is meant, and in this they are probably correct. One could, perhaps, distinguish between the terminology of the earliest believers (c. 35 A.D.) with that of the author of Acts (c. 70-80) [cf. also references in Acts 20:7, 11; 27:35]; but for the author of Luke-Acts, at least, it is extremely likely that “breaking (of) bread” served as a kind of shorthand reference and image for the Eucharist. This would seem to be confirmed by the narrative of Jesus’ appearance on the road to Emmaus (Lk 24:13-35), where Jesus comes to be known/recognized in the breaking of the bread (cf. verse 35, the only other occurrence of the noun kla/si$ [klásis, “breaking, fracture”] in the New Testament). For more on this passage, see below. Those who participate in the meal in an unworthy manner are, whether consciously or not, disregarding the sacred/symbolic aspect of the meal—it is not possible to reconstruct the ancient ritual element with certainty, but originally it probably centered upon a specific act of “breaking bread”, in imitation of Jesus’ own act. The nature of the problems at Corinth involved a lack of unity among believers, and this was reflected in the way they came together to celebrate the eucharistic meal (see v. 17-19ff). Here divisions in the body of Christ (the congregation) are juxtaposed against the body of Christ (bread and wine) broken/divided in ritual (but serving to promote unity and spiritual life). This draws upon the other major passage in the New Testament which specifically refers to the breaking of bread—namely, the miraculous feeding of the multitude—which I will discuss in the next few daily notes. 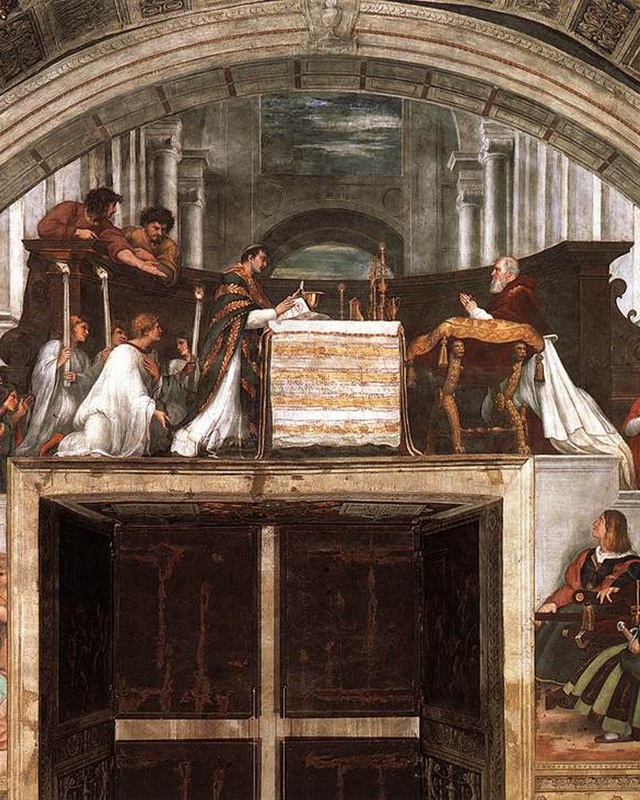 The feast of Corpus Christi was officially established by Pope Urban IV in 1264 A.D., associated with the so-called miracle of Bolsena in which the eucharistic wafer (host) was said to have bled and imprinted bloody images of the host upon the surplice of the officiating priest—therefore removing any doubts the priest (or others) may have had about the doctrine of transubstantiation and the Real Presence! The scene was commemorated most famously by Raphael in the Stanza (reception room) d’Elidoro in the Vatican palace.